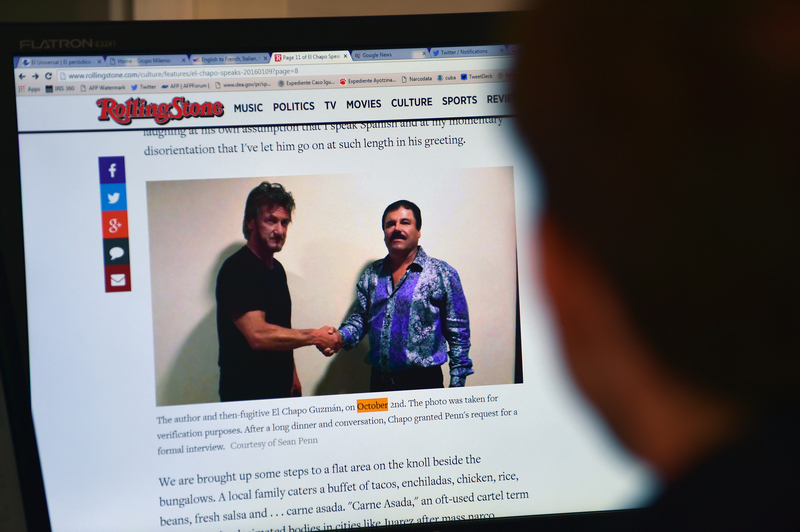 On Saturday, Rolling Stone published a story written by actor Sean Penn about infamous Mexican drug lord Joaquín Guzmán Loera, also known as "El Chapo." The story contains an interview that Penn conducted, both in person and through an intricate web of stealthy technology, with the kingpin himself. In it, El Chapo talked about everything from his childhood to his investment advice, but there's one quote from Penn's El Chapo interview that actually highlights the very important problem behind the current approach to the so-called "War on Drugs." To conduct the interview, Penn reportedly met with El Chapo in October at one of El Chapo's compounds in Mexico. Penn was supposed to return about a week later for a more formal interview, but El Chapo became hard to reach, likely because law enforcement was hot on his trail. Instead of another in-person meeting, El Chapo sent a recording of his answers to Penn's questions. In one of these questions, Penn asked El Chapo whether or not he felt responsible for the high level of drug addiction around the world. El Chapo's response was a resounding "no." El Chapo is probably the most powerful drug lord in the world. His cartel is larger even than that of Pablo Escobar, perhaps the only other name in this space that is as recognizable as El Chapo. He even seemed proud of that throughout the interview. He told Penn, "I supply more heroin, methamphetamine, cocaine, and marijuana than anybody else in the world. I have a fleet of submarines, airplanes, trucks, and boats." Despite his power, though, El Chapo admits in his response to the question that Penn posed to him that his existence does not have a make-or-break impact on the drug market. In other words, the world's drug problem will still exist even if he is locked up for the rest of his life and his empire is dismantled. It's an almost humbling statement, and it seems to highlight the very reason that Penn wanted to interview El Chapo in the first place. El Chapo's response begs the question: What can we do, then, to decrease drug addiction around the world? The War on Drugs has a controversial history in the U.S. It began in 1971, when President Richard Nixon declared that drug abuse was "public enemy number one in the United States." Interestingly enough, the only time that the majority of funding for the War on Drugs has gone to addiction treatment rather than enforcement was in the '70s, during the Nixon administration. As Penn points out in his Rolling Stone story, this manhunt for El Chapo has garnered the attention of American citizens, politicians, and media outlets — but it probably hasn't affected the market for drugs, at least not in the way that we need it to. At least in this case, the War on Drugs seems to be fighting a single man, rather than the societal problem. That's not to say that capturing El Chapo isn't important. Don't get me wrong, I'm all for cutting off the supply at its source. But as El Chapo himself knows, cutting off his ability to get drugs to Americans won't make them any less addicted.